This corset started out as a corset to go under the Luna Moth gown, but I realised that it would be a perfect example to illustrate the return to a relatively natural, if corseted, figure in the 2nd decade of the 20th century. I see parallels between the corset’s shape and the soft curves of goddesses in classical statuary. Egyptian cotton broadcloth with a faint pattern of lace in blush pink on white, lined in white linen, plastic whalebone (cable tie) boning. Cotton broderie anglaise and satin ribbons to trim. Elastic garter straps. 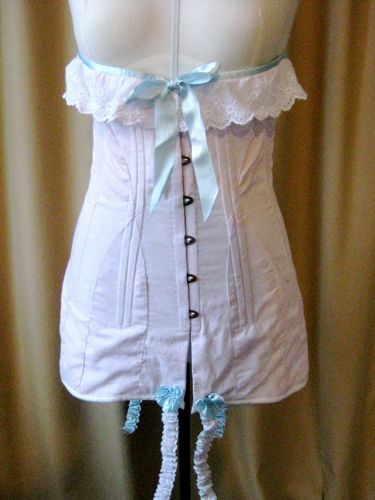 The corset is worn with fine lawn pantaloons and chemise, both trimmed in broderie anglaise. Note that the creation of this corset had a lot of overlap with the Luna Moth gown. Hello again! Hey I was wondering if you were still considering making this a pattern to offer on your site. I am really having a hard time finding a 1911 corset pattern for my History Alive dress. Hi, If you don’t get sorted out here, Past Patterns do an Edwardian mid bust with bust gores. Not too difficult to make, but has felled seams and needs the busk beefing up. It has straightish lines like the one here, but about 24 bones; you could always leave some out!